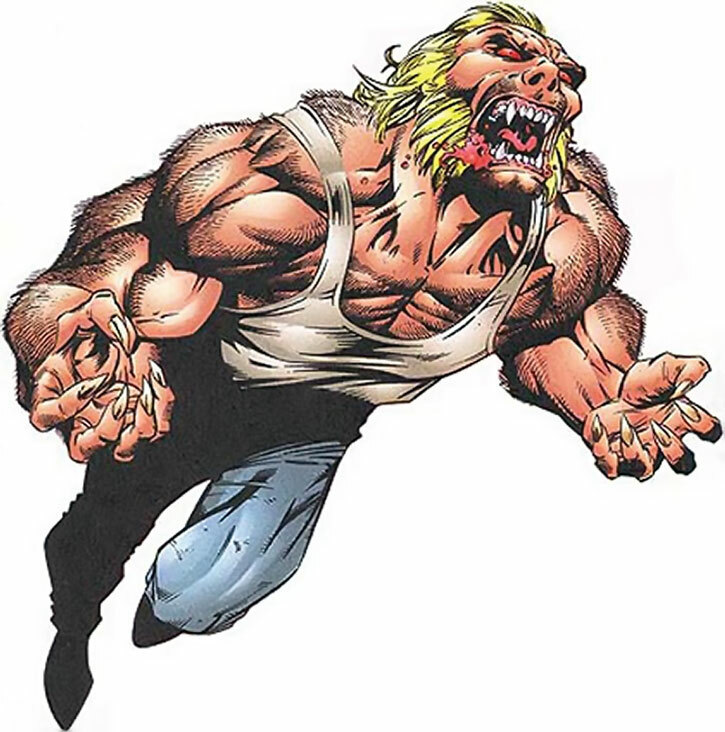 Though he was originally an enemy of Iron Fist, Sabretooth was reinvented as an evil and cruel version of Wolverine. He was even stronger and deadlier than the Wolvie, and had similar mutant powers. 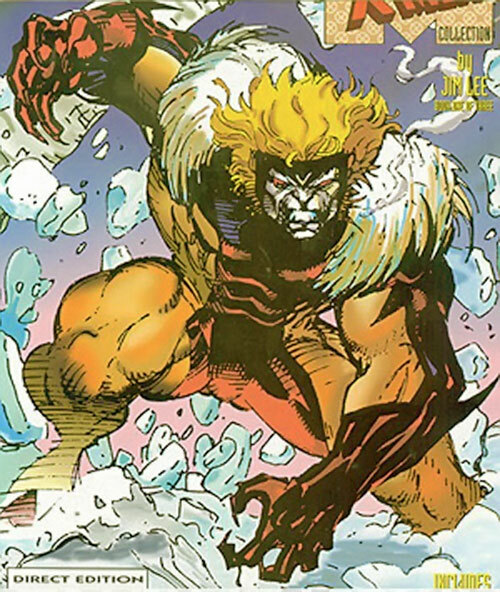 During the 1990s, Sabretooth was further developed as a character and his links to Wolverine clarified. This is a gisted profile, covering Sabretooth in general rather than digging into a specific take or era. 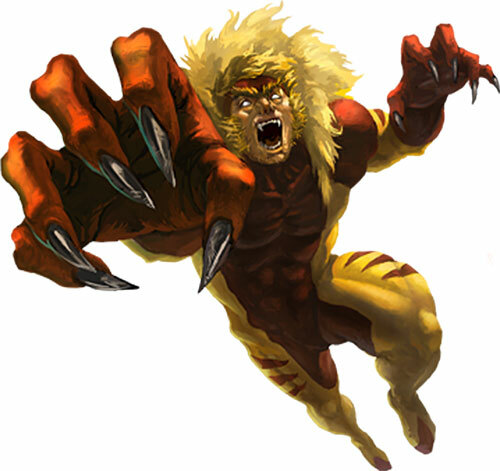 Former aliases: Sabretooth, El Tigre. Known Relatives: Possibly Wolverine (son? ), Craydon Creed (son, deceased). Group Affiliation: Formerly The Marauders, formerly X-Factor. Height: 6’6″ Weight: 275 lbs. 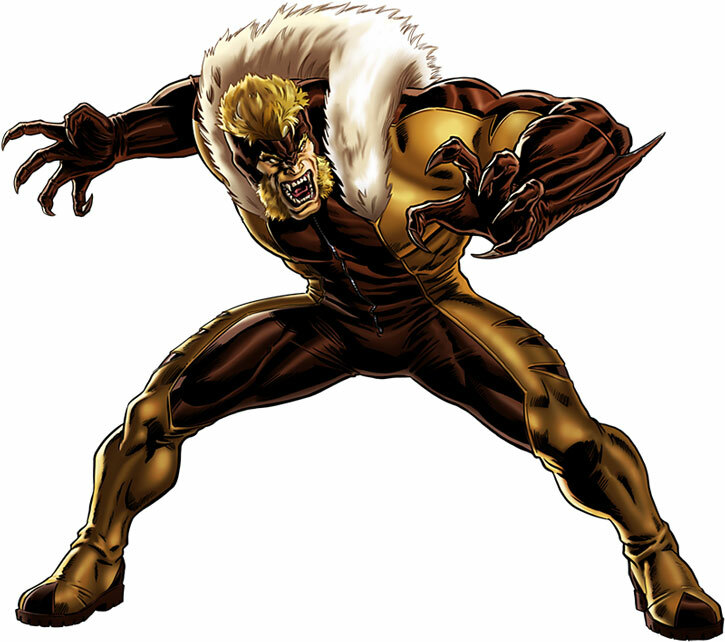 Sabretooth possesses remarkable speed, strength and pain threshold levels. He has predatorial animal cunning and senses, comparable or superior to those of certain animals. He is able to track down any opponent and sense anyone in his surroundings by smell, similar to a dog or wolf, sight, using night vision or sound, hearing supersonic frequencies and distant sounds alike. Thus, he’s nearly impossible to surprise. He is able to enter a savage berserker rage at will, and often does so, which renders him immune to any pain stimuli and increases his resistance towards mental control. His claws and teeth are strong enough to rend substances at least as durable as bone, and these are thus used for hacking and slashing opponents down. As if all of that wasn’t bad enough; Sabretooth can repair damaged or destroyed cells at an accelerated rate, and his healing factor renders him virtually immune to poisons and most drugs. Killing him appears to be a near impossible task; he has often believed to have been killed, but always turns up well and fighting somewhere else some other time. Ordinary bullets won’t bother him much. Muscle fatigue and other poisons are immediately taken care of, giving him superhuman endurance also. A further side-effect is that his aging is somewhat slowed down. From his agent days, he retains a large number of useful skills such as interrogation, firearms use, speaking Spanish and German, demolition and driving. Confined to a dark basement and subjected to other forms of psychological abuse by his father, Victor Creed survived to become the ultimate warrior. Sabretooth is driven by a psychotic need to hunt, fight and kill. Previous marks have included both humans and mutants. As a special operative for the Central Intelligence Agency, Creed frequently worked in partnership with the mysterious loner known only as Logan. 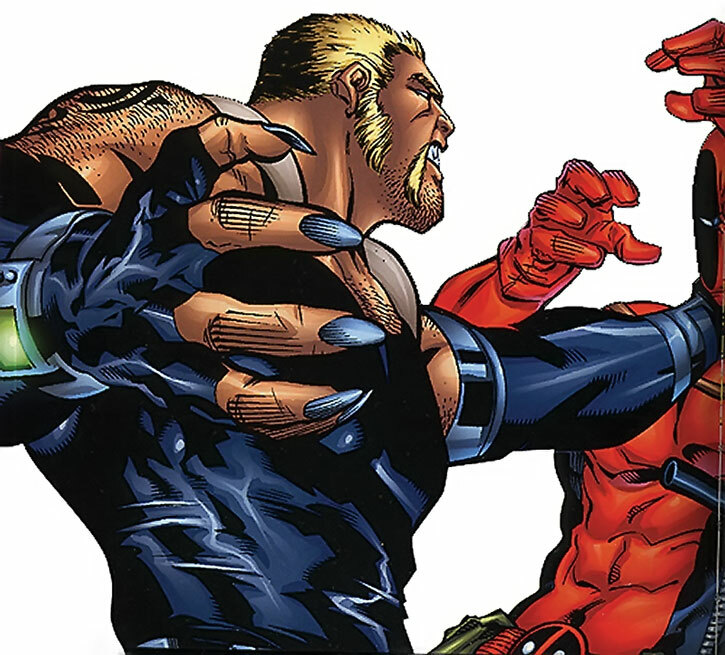 Codenamed Sabretooth and Wolverine, both were products of the mysterious Weapon X project — a government-sponsored initiative to breed the ultimate team of super-soldiers. In addition, the Weapon X scientists implanted false memories in their subjects for reasons that remain unclear. Uneasy allies at best, Creed and Logan had a falling out during a mission in Berlin. The two have been mortal enemies ever since. Creed fathered a child with the sinister mutant shape-shifter called Mystique. Ironically, their son grew up to become a staunch anti-mutant advocate, establishing the organization known as the Friends of Humanity. Prior to his assassination, Graydon Creed even ran for president of the United States. In Sabretooth’s first recorded exploit as a costumed criminal, he kidnapped the celebrated lawyer Jeryn Hogarth. Defeated by Iron Fist, a superhuman martial artist, Sabretooth next chose to run with a pack. 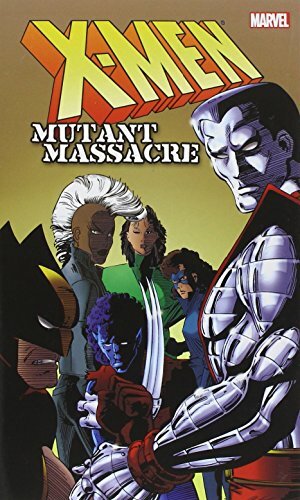 He joined the Marauders, a team of assassins employed by the mysterious Mr. Sinister, an obsessed geneticist working to create the world’s most powerful mutant. Helping carry out the massacre of the Morlocks, an underground community of mutant outcasts, Sabretooth again encountered Wolverine. 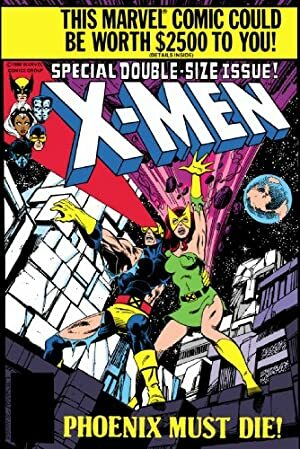 Logan was now a member of the X-Men, an outlaw team of mutant heroes. In the wake of several brutal skirmishes, the X-Men finally captured Sabretooth. Always mindful of the potential for good in others, Professor Charles Xavier — the team’s mentor, as well as an enormously powerful telepath — attempted to help Creed overcome his psychotic impulses. 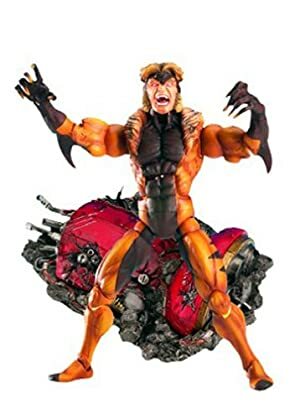 Infuriated upon discovering Sabretooth at Xavier’s mansion, Wolverine attacked his nemesis and injured Creed’s brain with one of his extensible Adamantium claws. Following his forced lobotomy, Sabretooth seemed unusually passive and peaceful. However, he recovered his true personality while pretending to remain docile and turned against the X-Men. He mortally wounded the telepath Psylocke. 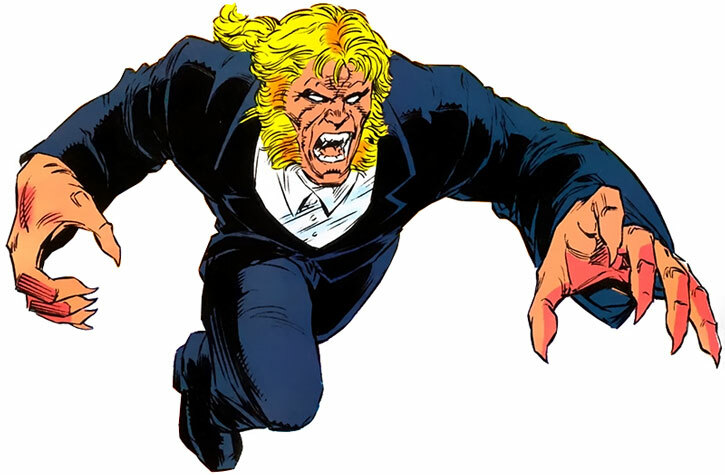 Sabretooth’s former employer, the U.S. government, came calling once again.&emsp.They conscripted him to serve with Mystique as a member of the second version of X-Factor, a team of superhuman mutant operatives. Creed was forced to wear an electronic restraining collar containing a nerve inhibitor that would administer a severe shock if he turned aggressive toward another person or attempted to remove the device. Eventually, Sabretooth succeeded in shedding the restraint. He savagely assaulted several other members of X-Factor, and then escaped. Later, Sabretooth signed on with a newly revivified, government-sanctioned Weapon X program. They not only gave him an Adamantium skeleton and claws (fingernails look like they’re coated in the stuff) but amped up his strength, speed and regenerative abilities. He’s now mentally conditioned not to harm Weapon X officers, but the project will cover up his activities. He boasted that he could kill a busload of schoolchildren and they would cover it up by the next day. Very recently, however, Apocalypse transferred the Adamantium from Sabretooth to Wolverine and who are now both their old selves again. What comes out of this remains to be seen. I’m sure you know and recognize the guy. In short, he’s a monstrously big, hairy man with blond hair, red eyes and sharp teeth and claws. His working costume changes rather often, but always consists of a certain color theme of at least 3 colors, such as brown, yellow and orange. He moves around like a predator, in a low stalking stance, and gives a very animalistic and aggressive impression. He has a notorious reputation as a blood-thirsty assassin and heroes, law-enforcement officers and mercenaries are likely to recognize and fear him on the spot. When he has been richly paid from some mercenary mission, he can sometimes be seen in an elegant black suit, black gloves, a red tie, with a brown fur coat on top, and a cigar in his mouth. 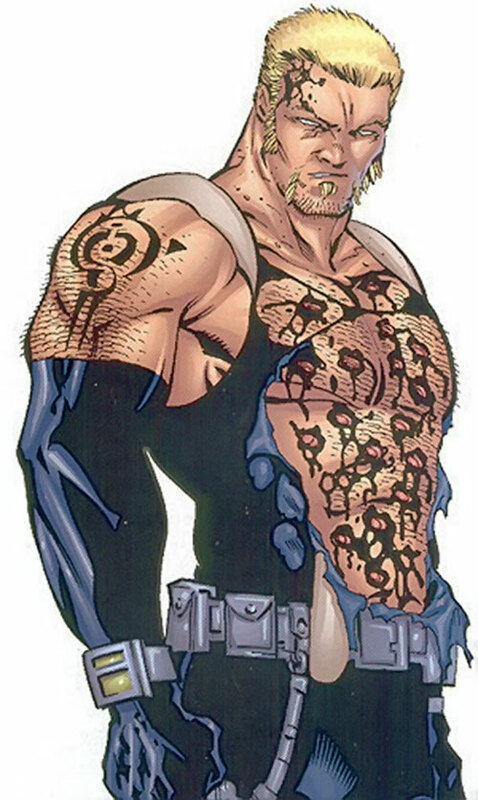 Sabretooth is a vicious sadist who enjoys causing others pain. When in combat, his savagery and brutality cause even the most hardened warrior to feel the icy grip of fear. In fact, he is renowned for his insatiable thirst for violence and an endless lust to kill. Possessive of a one-track predatorial mind, he is a feral, crude villain whose natural weaponry and unbridled savagery make him a terrifying foe. He certainly won’t take no for an answer. From his experiences and brainwashing he bears a great hatred towards the x-man called Wolverine. He attempts to kill him at Wolverine’s every birthday (tracking him around the world in order to do so). He really enjoys carrying all that hatred for Wolverine and loves to engage in combat with him at every occasion. He will thus also attempt to kill Wolverine’s close ones just for the heck of it. 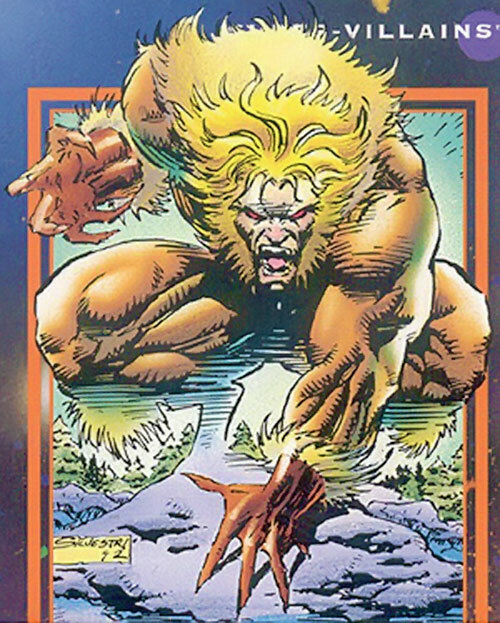 Sabretooth is not a discriminating man; he doesn’t differ between human, metas or mutants, but will gladly kill them all. He carries loyalty to no one except himself. Freedom is extremely important to him since it allows him to kill at will and randomly. He lives his life for the hunt and adventure and regularly engages in suicidal tendencies. He appears to bear some sense of nostalgia towards the rest of the members of the old Weapon X program, but still he attempts to kill them at nearly every occasion (unless forced to cooperate for one reason or another). Although a loner, he will accept team-ups if they allow him to combat (as in hack, slash, maim and kill) a powerful foe or several lesser ones. Even another serial killer is a most interesting prey and he gladly allies with enemies for such occurrences. His reputation as terrific assassin bears some sense of honor to him and he wants to be the best. He cares nothing about friendship and any potential friend he might have had, he’s sure to destroy with his actions. In short, he does whatever nastiness he damn well pleases to do. A true psychopath this one. Claws and Tracking Scent are Innate (+1). Iron Will can be added to AV to break free of mental controls (+2). Martial Arts skill included Natural Weapons (+1). Whenever Iron Will is used as a power, the Rage Drawback’s severity increases by one rank, INT is dropped by 2 APs and BODY is increased by 1 AP (20 pts). Iron Will usage represents entering a ’Berserker Rage‘ and can be entered practically at will, which Sabretooth does practically at every combat occasion (he very rarely attempts to resist his Rage Drawback). Iron Nerves, Languages (German, Spanish), Lightning Reflexes, Scholar (Survival), Sharp Eye, Slowed Aging. Constrictor (Low), Former and Current Weapon X Members (High), Marauders (Low), Street (Low), Underworld (Low), The Weapon X Program (Low). Archenemy (Wolverine), Mistrust (Mutant, sometimes only), Catastrophic Rage, Misc. Drawback (Amnesia and Memory Implants, 5pts), MPR (Color-blind), Traumatic Flashbacks (Weapon X brainwashing; when subject to mental manipulations by Powers). Recently joining up with the new Weapon X program, Sabretooth has received several ’upgrades’. As a result of these, his Physical stats and the Regeneration, Claws and Invulnerability powers are all 1 AP higher than given in this write-up. His government covered-up status gives him the equal of a High level Credentials to the Weapon X Program. He was also imbued with an Adamantium Skeleton (TM) for some time, but this has now been removed. His enhanced stats should remain, however, but without the benefits of the Adamantium. 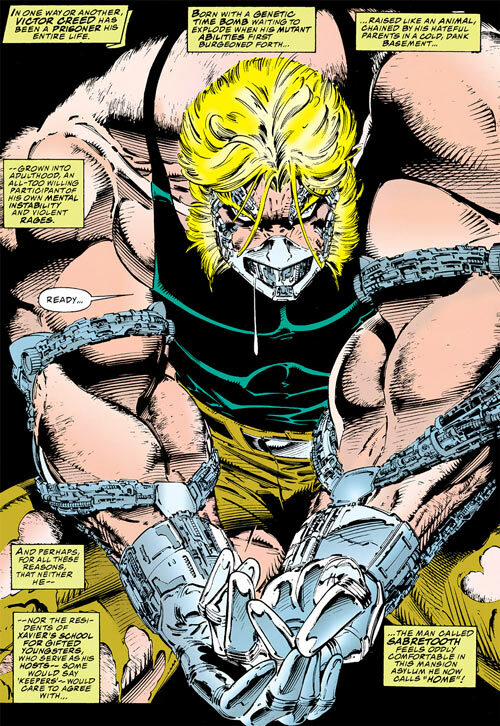 Sabretooth had an ADAMANTIUM SKELETON. This endowed him with the following abilities: EV 06 (08 w/STR), Misc. Advantage (Sabretooth’s bones and claws, laced with Adamantium, have a BODY of 25 APs against any attack specifically designed to break, cut, etc. his bones, 10 pts) and Attack Vulnerability (-1 CS OV/RV against Magnetic Attacks due to carrying an Adamantium Skeleton, 8 pts only). 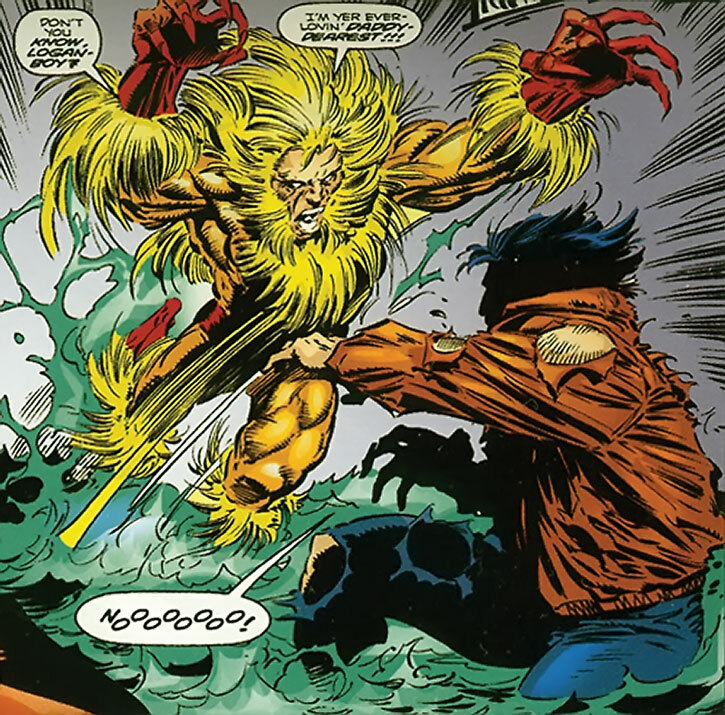 The Sabretooth seen as a nemesis of the Iron Fist was less powerful than the current incarnation. During these early days his STR was only rated at 05 APs and he possessed no regenerative abilities whatsoever (i.e. no Regeneration or Invulnerability). Also, all of his Physical Stats, Powers and Skills should be decreased by 1 AP each for such a setting and HPs adjusted to 40 HPs. In the current X-Men cartoon, Sabretooth is pretty close to the stats given here, but his STR is more likely an increased 09 APs instead. Source of Character: X-Men, Wolverine and Iron Fist comics, Marvel. Helper(s): Adrian Tullberg, Jay Myers, pufnstuff, Jackson, Gareth Lewis, Paul ’Z‘ Ewande, Douglas Ohlson, marvel.com , one banner from rapsheet.co.uk .